Based on James A. Michener’s novel about American prejudice against Japan after W.W. II, this timely musical seems both old-fashioned and second rate. James A. Michener’s Sayonara was a bestselling novel in 1954 and was turned into a popular 1957 film starring Marlon Brando which won four Oscars. 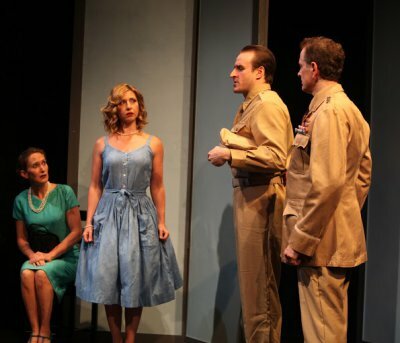 The first musical from Michener’s work was Rodgers and Hammerstein’s Pulitzer Prize-winning South Pacific, successfully revived to critical and popular acclaim by Lincoln Center Repertory Theater in 2008. Ironically, it was reputedly its original director and co-writer, Joshua Logan, who suggested that Michener write the semi-autobiographical Sayonara, a love story overcoming the prejudice between Yankee officers and the native Nipponese, so that it could be made into a Broadway musical. (Michener’s third wife was Japanese-American.) The resulting show did not happen until many years later with an entirely different team of creators. 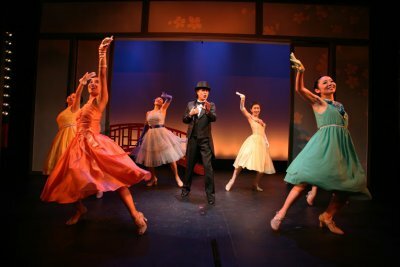 Although Sayonara, The Musical had an acclaimed lavish production at Paper Mill Playhouse in 1987 and a later version at Houston’s Theatre Under the Stars in 1993, it has not been seen in New York until now. Pan Asian Repertory Theatre, now in its 38th Season, is presenting the local premiere of the adaptation with its book by playwright William Luce (The Belle of Amhurst, Lillian, Lucifer’s Child, and Barrymore), lyrics by Hy Gilbert and music by George Fischoff. 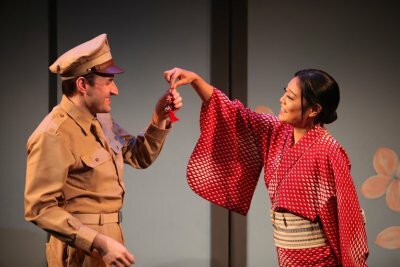 Surprisingly, Sayonara has a great deal in common with South Pacific: the exotic Asian locale, the fraternization between Yankee officers and Asian women, a tale of prejudice and bigotry, and two parallel love stories. Unfortunately, at this post Sondheim junction, the way Sayonara follows the Rodgers and Hammerstein formula seems dated, while the material, based more on the movie than the original novel, has deflated Michener’s story by making it oversimplified and superficial. The material calls out for a lavish production and a huge orchestra. Unfortunately, Pan Asian Rep has staged the show on a shoestring and the sketchy looking sets and small crowd scenes undermine the weak adaptation. Additionally, the orchestrations to tinny keyboard and reeds do Fischoff’s melodies no service, while the lyrics are banal and prosaic. The story centers on the reeducation of Major Lloyd “Ace” Gruver, a hero pilot in the Korean War. Sent to Kobe, Japan, for a little R&R by his commanding officer Gen. Webster, Ace is surprised to see his fiancée Eileen, the General’s daughter when he gets there. The General and his pushy and domineering wife Miriam hope that Ace’s engagement to their daughter will lead to an imminent marriage. However, Ace can’t bring himself to set a date and Eileen is fearful that he will turn into his father, a four-star general who lives only for his work and ignores his loyal wife. Ace holds the same prejudiced views about the Japanese that Mrs. Webster has but is a little more reticent about them. When a member of his troupe, Private Joe Kelly, wants to get married to his Japanese girlfriend Katsumi (knowing full well that he can’t take her back to the States), Ace tries to talk him out of it. But when he witnesses some bigoted behavior at the Officer’s Club for which Mrs. Webster is responsible and that embarrasses him greatly, he agrees to be Kelly’s best man. On his night off, when Ace is taken to a performance of the famous all-female Takarazuka Theatre, he falls in love at first sight with the star performer Hana-Ogi, even though she mostly plays men’s roles. However, the women of the troupe are very much cloistered and not allowed to go on dates or have boyfriends. Kelly comes to the rescue when it turns out Katsumi has been head of Hana-Ogi’s fan club. Ace is secretly able to woo Hana-Ogi at Joe and Katsumi’s house. And then a ruling comes down from the high command that American soldiers can no longer be seen with Japanese women in public. Suddenly, life becomes very difficult for both Ace and Joe. In musical terms, the highlight of the show is the five-song sequence that takes place on the stage of the Takarazuka Theatre where Ace is smitten with Hana-Ogi. Unfortunately, the choreography by Rumi Oyama looks like bad Broadway, rather than good Japanese dancing, and the songs are weak efforts by the lyricist-composer team. Hana-Ogi (played by Ya Han Chang) is backed by only six performers and the production numbers look slight. The numbers do not show Hana-Ogi’s range as they did in the movie, so we never understand what attracted Ace to her. Dramatically, the prejudice of Mrs. Webster, the American Consul and Kelly’s Colonel Craford is so blatantly hysterical (when it should be subtle and understated) that it is almost comic and caricaturish. Sheryl Liu’s simple sets, nothing more than sliding screens and a symbolic red bridge (which connects the Takarazuka Theatre with its dormitory), create very similar and uninteresting stage pictures. A more splendid production might have shown how Ace is seduced by the allure what he sees and experiences. Staged by Tisa Chang, artistic producing director of Pan Asian Rep, the cast is uneven, with the majority of the men seeming more bland or one-dimensional than the women. As in the film, the best role is that of Private Joe Kelly, and Edward Tolve makes the most of his opportunities. As Ace Gruver, Morgan McCann is stalwart but stiff and bland, missing the charisma that the role needs to make us root for him. While the Japanese girlfriends played by Ya Han Chang (Hana-Ogi), Natsuko Hirano (Katsumi) and Oyama (Fumiko) are much less stereotyped than these sort of Madame Butterfly roles have been played in the past, the writing is trite enough to undermine anything the actresses can do. Scott Klavan as the General caught between his wife’s bigotry and his own more balanced views is rather ineffectual, while Justin R.G. Holocomb’s racist Colonel Craford just seem vicious without reason. While Martha Scott made Mrs. Webster warm and sincere in Logan’s movie version, sugarcoating her bigotry, Sandy York’s Miriam is obvious and strident. Jennifer Piacenti’s Eileen is saddled with an unfortunate hairdo which undermines taking her seriously. Only Ako Dachs as the Takarazuka master teacher and supervisor is impressive in both her dignity and in her subtlety. Not surprisingly her authenticity may come from the fact she has appeared previously in the Paper Mill Playhouse and Houston productions, and the West Coast tours in other roles, as well having been a former member of the actual troupe in Japan. While the Japanese costumes by Keiko Obremski are colorful and attractive, they are not color-coordinated so that they do not make the sought-after impression on American eyes that they might have. As a story of star-crossed lovers, Sayonora, The Musical still has its moments and tells an engrossing story. While the theme of toleration between races is as timely as ever, this musical unfortunately seems dated and hackneyed. As a contender for being taken for a lost masterpiece newly rediscovered after 28 years, the Pan Asian Repertory production is too flawed to cover up the old-fashioned presentation and thin adaptation to be a cause for rejoicing. This bleak, kitchen sick drama with political overtones is very well acted, but is by its nature a downer. Its downtrodden characters struggle valiantly. World premiere play by Samuel D. Hunter for Theater Breaking Through Barriers was written for six actors with disabilities which fulfills the company’s mission.